Last month, I took up rock climbing; something I haven’t really pursued since I was a kid at summer camps and birthday parties at our local rock gym here in Davis, CA. 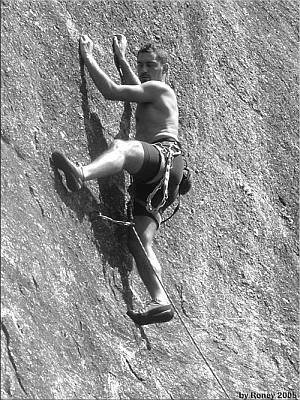 I’m not sure if it was the rediscovering of muscles long-neglected in my forearms or wondering where the “n00b routes” were, but there was no mistaking the fact that I was a beginner. This quote has always amazed me, since “beginner” is far from what comes to mind when most people think of (even a young) Steve Jobs, perhaps the greatest influence on this generation’s technological revolution. The more I think about it though, the more it makes sense. Whether you are rock climbing, picking up an instrument, or starting your own business, being a beginner can have it’s benefits. Part of being a beginner to me is the ability to say “I might be wrong” and to challenge my pre-existing beliefs. It’s not easy (I know, I can be pretty stubborn sometimes), but I’ve found that the growth I’ve experienced from challenging and tabling my personal views has allowed me to discover so much more than I would have otherwise. It allows me to quiet down and listen to and understand more perspectives and viewpoints, and make room to focus on listening to what more experienced people have to say. What I’ve learned in the past month is how friendly and welcoming the rock climbing community really is. As a beginner, people are willing to show you the ropes and make your time at the gym more enjoyable. I get the impression that they like seeing beginners in there, and are stoked on helping you progress and get better. I spend a good portion of my time there chatting with people and asking them questions. I’m not afraid to let them know I’m a beginner, and I feel like when I let them know that, they’re more willing to help out. It seems like people appreciate it when you let go of your ego and genuinely want to learn from them and their experience. You know that look of a baby taking in it’s surroundings where you can see that they are a sponge just soaking everything in? That’s kind of the feeling I get whenever I’m in “beginner mode” and is what makes being a beginner so appealing to me. In the search engine optimization world (and tech in general), given how rapidly the algorithms change and new technologies are coming into play, the most knowledgeable people seem to be the lifelong learners who are always trying to discover the latest and greatest. Would you rather be a beginner or an expert or both? Sound off on the comments! Totally agree with this. It is often beneficial to look at things from a beginner’s perspective so that we can remove our preconceptions and truly learn something new! Agree completely! I suggest all the people I mentor take a class a year in something they know nothing about so they stay in touch with the excited vulnerability of being a beginning student. Great post!